Buy Online Now! 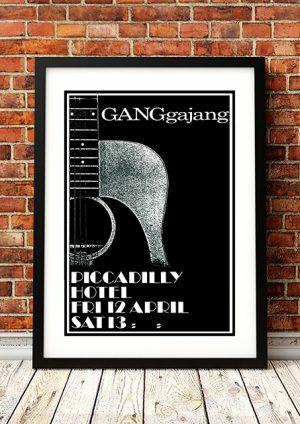 Classic Gangagang Concert Posters and Memorabilia! Ganggajang are an Australian pop rock band which formed in 1984. Three of the founders are frontman Mark ‘Cal’ Callaghan (ex-Riptides) on guitar and lead vocals, Chris Bailey on bass guitar and Graham ‘Buzz’ Bidstrup on drums (both ex-The Angels). They were soon joined by Geoffrey Stapleton (ex-Aliens] on keyboards, guitar and vocals, and Robbie James on lead guitar. Their most popular song, “Sounds of Then”, a.k.a. “This Is Australia”, was issued in December 1985 and peaked in the top 40 on the Australian Music Singles Chart. It became familiar to Australians ten years later when it was used on TV in a Coca-Cola ad and then for the 1996 Nine Network station ID promotion. 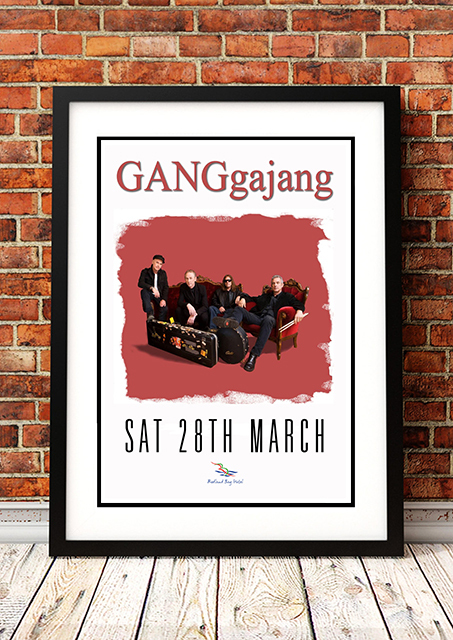 Their highest selling album was GANGgajang , which was released in November 1985. They have issued three other studio albums, Gang Again (1987), Lingo (1994) and Oceans and Deserts (2002). We stock some awesome Gangagang Prints.